You can find full details of Thailand's visa requirements at Thailand Ministry of Foreign Affairs. However, most visitors do not need to trawl through all this information. All you really need to know is that if you have a passport from one of the following countries then you are exempt from visa requirements and will receive a 30-day entry stamp on arrival. You can extend the 30-day entry stamp by a further 7 days at an immigration office in Thailand for a fee of 1900 baht. You can get a 60-day tourist visa before entering Thailand. 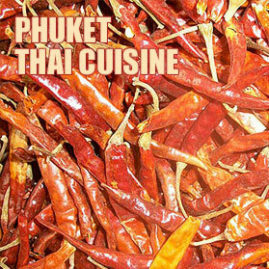 You can obtain these from a Thai Embassy or Consulate in your home country. Then when you arrive in Thailand make sure you enter the visa number on your arrival card so the immigration officer knows you have a visa and gives you a 60-day entry stamp on arrival. You can extend this by another 30 days at an immigration office in Thailand for a fee of 1900 baht allowing a 90-day visit without leaving the country. 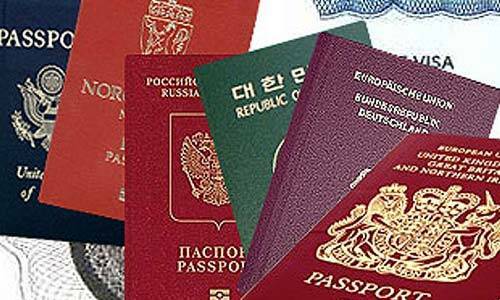 It is possible to get multiple tourist visas. These entitle you to two or three 60-day visits. However, between each 60-day visit (and optional 30-day extension) you must leave Thailand and then re-enter the country. The second option is to do what is known as a visa run. This involves leaving Thailand before your entry stamp expires, entering a neighbouring country and then returning to Thailand where you will receive another 30-day entry stamp. The term visa run is a little misleading as what you are getting is not actually a visa - it is a 30-day visa waiver. Note that as from 1st October 2006, they have changed the rules so that you can stay in Thailand for a maximum of 90 days out of 180 with visa runs. After 90 days, you must get a visa or leave the country. In Phuket, the normal visa run is to Myanmar (formally Burma). There are several companies that organise visa runs. They run either buses or minibuses to Ranong where you get your passport exit stamped from Thailand. You will then take a boat to Myanmar, stamp your passport in and out of Myanmar before returning to Ranong to get a new entry stamp into Thailand. The whole trip takes around 12 hours and costs around 1,500 baht. A more pleasant alternative is to fly to a neighbouring country and turn the visa run into a trip. Singapore and Kuala Lumpur are popular choices. You can get two or three day tour packages to these cities for very reasonable prices and then return to Phuket and receive a new 30-day entry stamp. You should always check the date on your entry stamp when you enter the country. Do not stay beyond the permitted to stay date. The fine for overstay is 500 baht per day. If you pay the fine when you are leaving the country then you will receive an overstay stamp in your passport but normally no other repercussions. However, if during your stay in Thailand the police have cause to check your passport and find you have overstayed, they will treat you as an illegal alien. You may spend a night or two in a cell before being deported to your home country and blacklisted from Thailand. There are longer-term visas available to people who want to live in Phuket based on retirement, family or work qualifications. There are also small immigration departments at the boat ports to deal with people arriving by sea. The TAT tourist office is in Phuket Town on Thalang Road next to Queen Sirikit Park near the junction with Montree Road. It is a new bright orange building. 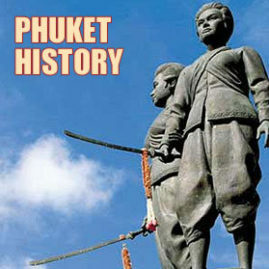 You can find tour brochures, pamphlets, maps and general information about things to do in Phuket. 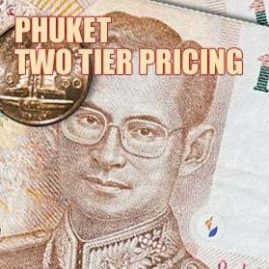 The exchange rates available in Thailand are generally a little better than those in western countries. The best exchange rates are from ATM's but it depends on what fee your bank charges for this service. There are lots of banks and exchange booths in the tourist towns and in Phuket Town where you can change cash, traveler's cheques or use a credit/debit card. They usually give competitive rates. The worst rates are from hotels. Thailand bank opening hours are Monday-Friday 8.30am-3.30pm. There are exchange booths in Patong open to midnight and beyond. The international dialing code from Thailand is 001 followed by the relevant country code. 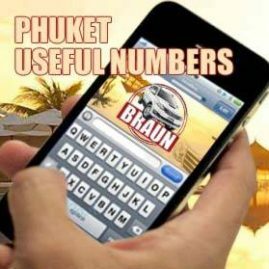 The country code for Thailand is +66 and the area code for Phuket is 076.
International calls are reasonably cheap. Many internet and tour shops offer telephone services which are cheaper than hotel rates. Mobile phone coverage in Phuket is good. You can use a mobile telephone from your home country if you have international roaming options. Another alternative is to buy a mobile phone in Thailand with a prepaid sim-card. You can buy a reasonable mobile phone with pre-paid sim-card from as little as 1,500 baht. Internet shops are everywhere. Broadband connections are now standard and the reliability is generally good. If you are near the beach, you can expect to pay two baht a minute. Further from the beach, prices drop to one baht a minute and if you get out of the tourist resorts then you can find internet shops charging 20 baht an hour. Postal services seem less important in these days of e-mail and text messaging. Post to/from the west takes 7-14 days either way. It is generally reliable but anything valuable should definitely be sent registered mail. Phuket Town Main Post Office is on Montri Road just north of the junction with Phang Nga Road. Patong Post Office is on Rat U Thit Road near the entrance to Patong Grand Condotel. There are several other small Post Offices around the island. Value Added Tax is 7%. This amount is already included in prices displayed in shops. Small restaurants, shops and stalls will not charge it anyway as they will not be registered. Larger restaurants and hotels may add 7% to your bill and some will also add a 10% service charge. 220 volts, 50 Hz. Electricity sockets generally accept both two pin round and two pin flat plugs. Adapters for other plugs are easy to find in local shops. Phuket has a wide range of good quality healthcare facilities. Health tourism is one of the attractions of the island. 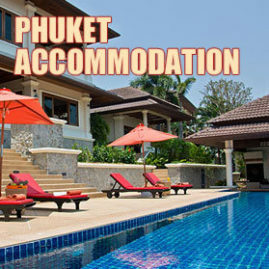 For a much lower price than most western countries, you can avoid waiting lists and receive private treatment in Phuket. There are two major private hospitals on the island. Next to Big C on the bypass road. There are also several government hospitals and lots of private clinics. The private clinics will have a qualified doctor and many open long hours. There are plenty of well-stocked chemists. A lot of them will sell medicine without a prescription so if you go straight to a chemist make sure you know what you want. Some will sell drugs such as sleeping tablets, Viagra and steroids on request. The small private chemists are more likely to sell such drugs without prescription - it is just a matter of asking around. 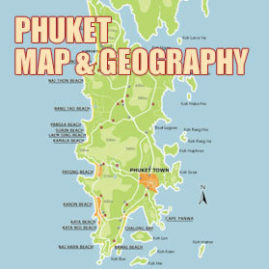 You do not need to take any vaccinations before visiting Phuket. If you are visiting other parts of Thailand then it may be worth consulting your doctor. 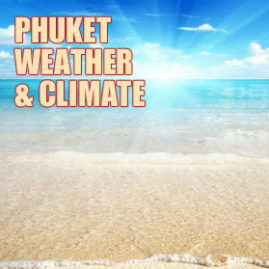 Phuket does not have Malaria but there is Dengue Fever which is also transmitted by mosquito bites. Dengue causes a very unpleasant fever and headache that will knock you off your feet for a week. It can be more dangerous if you catch it a second time as the body's immune system can react incorrectly to a different strain of the virus. As yet, there is no vaccination for Dengue. Cases of Dengue are rare in Phuket but it is worth wearing insect repellent to be safe. Even if you are not visiting Phuket specifically for healthcare you may want to take advantage of the excellent deals available from dentists and opticians where you can make huge savings compared to what you would pay at home. Until recently you had to pay airport tax on departure from the country and you needed 500 baht at the airport when you left the country. The airport tax has now been increased to 700 baht but it should now be included in the price of your ticket.